be quiet! 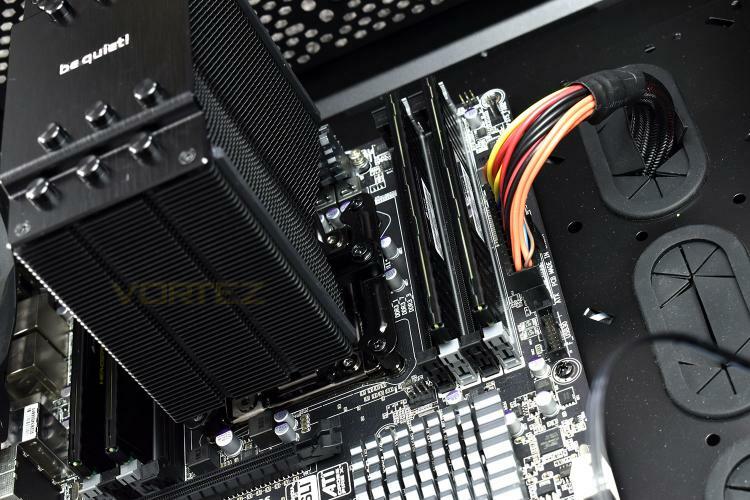 first announced the Dark Rock 4 and Dark Rock Pro 4 at CES in January, where they promised similar cooling levels to the previous generation, with improvements to noise levels and installation methods. Our review of the Dark Rock Pro 4 can be found here. The Dark Rock 4 is a single-tower CPU cooler featuring 6 copper heatpipes, many ceramic-coated aluminium fins and a 135mm Silent Wings fan, in the hope of achieving near-silent operation while keeping temperatures in check. Weighing in at 920g, including the fan, and measuring 159mm x 136mm x 96mm, it’s certainly not on the smaller side and will require a decent sized chassis for height clearance. be quiet! have included their renowned Silent Wings 135mm fan, using a 6-pole motor and PWM connection, along with the fancy rippled blade design to aid airflow while reducing noise output. Priced at £65, and promising up to 200W of heat dissipation, we foresee great things from the Dark Rock 4, read on to see how it fares against a Core i7-3930K. be quiet!, the market leader in PC power supplies in Germany for twelve consecutive years*, announces its Dark Rock 4 series of CPU air coolers for high performance processors. Dark Rock 4 and Dark Rock Pro 4 keep most of their predecessors’ near-silent operation and performance features, but also introduce innovative and optimized functions that ultimately produce the best processor cooling at extremely low noise levels.